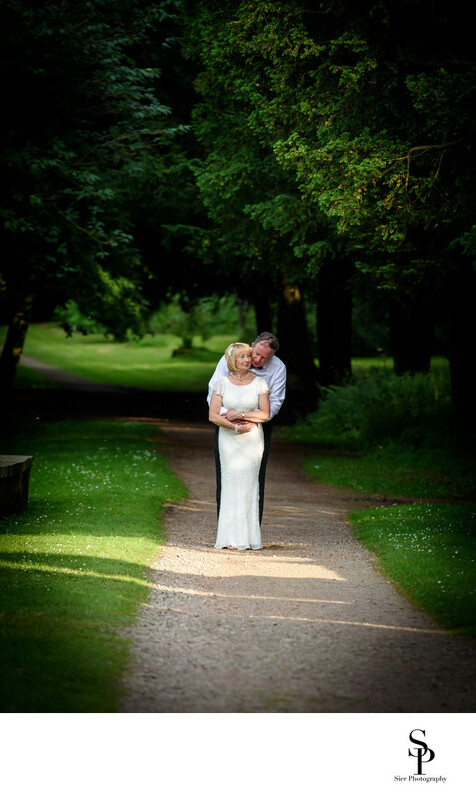 Summer wedding photography at the magnificent Wortley Hall Hotel. This is a spectacular venue located between Sheffield and Barnsley with some amazing grounds and a truly spectacular selection of reception rooms. The grounds are home to a massive collection of rodedendron bushes which provide an unbelievably colourful display at the high time of the year. When we photograph a wedding we always try to get some pictures of at least the bride and groom outside and if possible the larger group photographs. This isn't always possible due to the nature of the British weather but always worth a try! This picture was taken in the grounds of Wortley Hall very near to the main house. The grounds offer some spectacular panoramic views of the surrounding countryside as well as offering some wonderful photo opportunities for those prepared to take a wander around the grounds. The grounds feature a spectacular lake and kitchen garden which look magnificent as does the fountain in front of the main house. We had a great time with our bride and groom exploring the gardens and got some lovely images of the two of them together as well as the larger group photo on the steps down from the ground near the secret rooms! It was a fantastic day, very very warm but great fun to photograph and document. 1/250; f/4.5; ISO 100; 200.0 mm.